WOULD THAT THE LORD MIGHT BESTOW HIS SPIRIT ON THEM ALL! Our readings this Sunday remind us that the Holy Spirit is an equal opportunity bestower. The community of God's people is not an exclusive club where only the "in-crowd" is recognized. As Moses said to Joshua, "Would that all the people of the Lord were prophets!" In our first reading (Numbers 11:25-29), we hear of 70 elders upon whom the Spirit had descended to assist Moses in his mission. When Joshua discovered that two others had also received the Spirit, he was jealous. Moses set him straight. The LORD came down in the cloud and spoke to Moses. Taking some of the spirit that was on Moses, the LORD bestowed it on the seventy elders; and as the spirit came to rest on them, they prophesied. Now two men, one named Eldad and the other Medad, were not in the gathering but had been left in the camp. They too had been on the list, but had not gone out to the tent; yet the spirit came to rest on them also, and they prophesied in the camp. So, when a young man quickly told Moses, "Eldad and Medad are prophesying in the camp, " Joshua, son of Nun, who from his youth had been Moses' aide, said, "Moses, my lord, stop them." But Moses answered him, "Are you jealous for my sake? Would that all the people of the LORD were prophets! Would that the LORD might bestow his spirit on them all!" Our Gospel reading (Mark 9:38-43, 45, 47-48) echoes our first reading wherein the young apostle John was indignant that someone not of their group would dare to exorcise demons in the name of Jesus. "Do not prevent him." replied Jesus. He then went on to instruct them further on the obligations of discipleship. 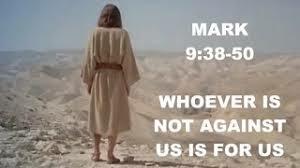 At that time, John said to Jesus, "Teacher, we saw someone driving out demons in your name, and we tried to prevent him because he does not follow us." Jesus replied, "Do not prevent him. There is no one who performs a mighty deed in my name who can at the same time speak ill of me. For whoever is not against us is for us. Anyone who gives you a cup of water to drink because you belong to Christ, amen, I say to you, will surely not lose his reward. "Whoever causes one of these little ones who believe in me to sin, it would be better for him if a great millstone were put around his neck and he were thrown into the sea. If your hand causes you to sin, cut it off. It is better for you to enter into life maimed than with two hands to go into Gehenna, into the unquenchable fire. And if your foot causes you to sin, cut if off. It is better for you to enter into life crippled than with two feet to be thrown into Gehenna. And if your eye causes you to sin, pluck it out. Better for you to enter into the kingdom of God with one eye than with two eyes to be thrown into Gehenna, where 'their worm does not die, and the fire is not quenched.'" In our Epistle reading (James 5:1-6), the author calls a warning to those whose ill-gotten wealth came at the expense of others and to those who use their wealth to fatten themselves instead of for a more equitable society. Come now, you rich, weep and wail over your impending miseries. Your wealth has rotted away, your clothes have become moth-eaten, your gold and silver have corroded, and that corrosion will be a testimony against you; it will devour your flesh like a fire. You have stored up treasure for the last days. Behold, the wages you withheld from the workers who harvested your fields are crying aloud; and the cries of the harvesters have reached the ears of the Lord of hosts. You have lived on earth in luxury and pleasure; you have fattened your hearts for the day of slaughter. You have condemned; you have murdered the righteous one; he offers you no resistance. Whether it be the rich or the members of the "in-crowd", those who see their membership in the body of Christ as an exclusive club have been put on notice. God's wealth and God's spirit is to be shared with everyone, especially the lowest, the poorest, the weakest - "these little ones", as Jesus called them. Our blessings, whatever they may be, are meant to be shared. It is only in giving that we truly receive. This week the Tabernacle Light will burn in loving memory of Father Donald McCarthy. Our Sunday Breakfast ministry has been going strong for 44 years, serving a delicious breakfast with a side of fellowship on Sunday mornings from 8:30-11:00 am, September through May. Each team prepares and serves breakfast one Sunday morning a month. Who are we looking for? Families with children, teens, singles, couples…anyone can be a part of a team! What is involved? Cooking, setting tables, serving, and cleaning up are all a part of this fun and friendly ministry. How can I get involved? Call the parish office at 671-1100 for more information on how to join a team!